Full name of UK legal entity: EAC Management Ltd, a limited company with registered number 07215800. EAC Management Ltd is registered, and operates, in the United Kingdom. Full name of Australian legal entity: FromHereOn Pty Ltd, ABN 77 605 278 724. FromHereOn Pty Ltd is registered, and operates, in Australia. You can also contact us through our enquiries page via the form or contacting your nearest FromHereOn office by phone. You have the right to make a complaint at any time to the Information Commissioner’s Office (ICO), the UK supervisory authority for data protection issues (https://ico.org.uk). In the UK, please read: https://ico.org.uk/for-the-public/raising-concerns/ for details of how to do this. We may need to update this Policy at any time and will notify you of any such changes through email. · Automated technologies or interactions: As you interact with our website, we may automatically collect Usage Data and Technical Data about your equipment, browsing actions and patterns. We collect this personal data by using cookies, server logs and other similar technologies. Please see our Cookies Policy for further details. · Essential Service Providers: Sometimes, other businesses give us data about you which we may need for our legitimate interests of conducting business with you and on occasion they are necessary to perform our contract with you. It usually comprises Financial Data or Transaction Data. 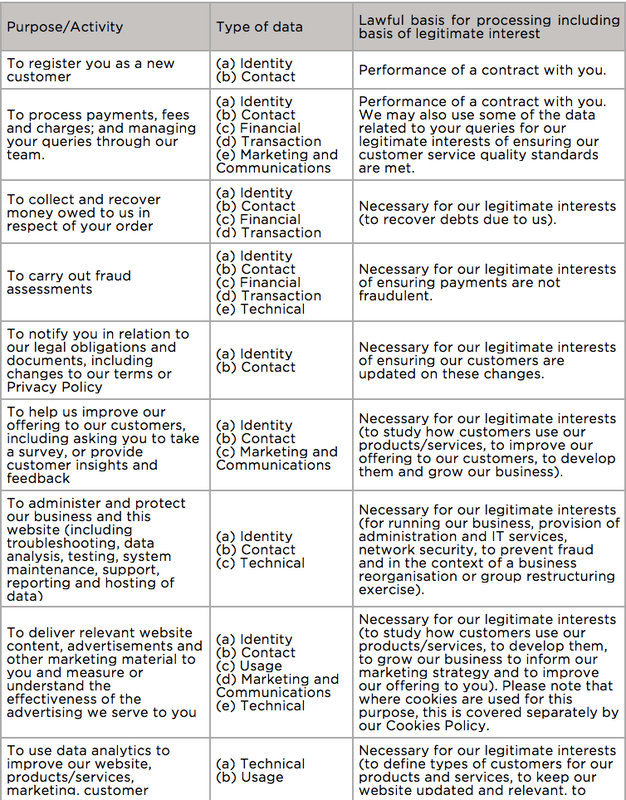 This happens when we link through to third party payment providers. They tell us that you have paid for your products and, where relevant and/or necessary they will provide us with your Contact Data and Transaction Data. We also might engage third party contractors to provide us with technical or delivery services that are related to the services we provide to you. Generally, we do not rely on consent as a legal basis for processing your personal data other than in relation to sending third party direct marketing communications to you via email or phone. You have the right to withdraw consent to marketing at any time by unsubscribing using the link in any email, or verbally if contacted over the phone. We do not conduct any automated decision making. We may on occasion profile our customers for the purposes of targeting marketing at them and where this is done, this is undertaken for our legitimate interests of ensuring our marketing is relevant to its audience. For example, we may classify an appropriate audience for a promotion by what products on our website they have previously expressed an interest in. We do not conduct any online behavioural tracking. We may use your Identity, Contact, Technical, and Usage Data to form a view on what we think you may want or need, or what may be of interest to you. This is how we decide which products, services and offers may be relevant for you. We only use the data you provide to us directly for this purpose along with the Aggregated Data provided to us by our analytics partners and we do not track what other websites you may visit after visiting our site, though in common with most websites, we may register the site which referred you to our site (e.g. a search engine). We generally only send electronic marketing - such as email marketing - to people who have previously bought similar products from us or who have made enquiries about any of our products and services, and this is in our legitimate interests. We will always offer a way out of receiving this marketing in every marketing communication you receive. We may on occasion send out postal marketing for the purpose of growing our sales which is in our legitimate interests and in this scenario we will rely on you to let us know if you do not want to receive this by opting out of marketing (see Opting out below). We require all third parties to respect the security of your personal data and to treat it in accordance with the law and they may only use your data for the purposes we specify in our contract with them. Any disclosure of your data will be made lawfully in order to protect your privacy. · Where we use providers based in the United States, we may transfer data to them if they are part of the Privacy Shield which requires them to provide similar protection to personal data shared between the Europe and the US. We have put in place appropriate security measures to prevent your personal data from being accidentally lost, used or accessed in an unauthorised way, altered or disclosed. In addition, we limit access to your personal data to those employees, agents, contractors and other third parties who have a business requirement for access. They will only process your personal data on our instructions, in line with our policies and procedures of such processing, and they are subject to a duty of confidentiality. We have put in place procedures to deal with any suspected personal data breach and will notify you and any applicable regulator of a breach where we are legally required to do so. We take personal data breaches seriously, and will endeavour to ensure any security risks are monitored and addressed quickly and effectively to provide your data every possible protection. To determine the appropriate retention period for personal data, we consider the amount, nature, and sensitivity of the personal data, the potential risk of harm from unauthorised use or disclosure of your personal data, the purposes for which we process your personal data and whether we can achieve those purposes through other means, and the applicable legal requirements. For example, details of your purchases of services will be kept for as long as we need to retain that data to comply with our legal and regulatory requirements. This is generally 7 years unless the law prescribes a longer period. If you wish to exercise any of these rights, please Contact Us, marking your query for the attention of the DPO. We will respond to all legitimate requests within 30 days. Any third party with whom we choose to share data with has been vetted to ensure their compliance with our Privacy regulations. Partners - when you place an order, we may share your information with a third party for the purposes of providing the purchased service or product. By visiting this website with your browser settings adjusted to allow cookies, you are consenting to FromHereOn using cookies for the purposes outlined below in order to provide you with a fully functional customer experience. Your browser accesses the cookie file only when you visit the website that generated it. This helps to ease your navigation through our website. We use performance cookies on our website. These allow us to recognise and count the number of visitors and to see how visitors move around our website when they are using it. This helps us to improve the way our website works, for example, by ensuring that users are finding what they are looking for easily. 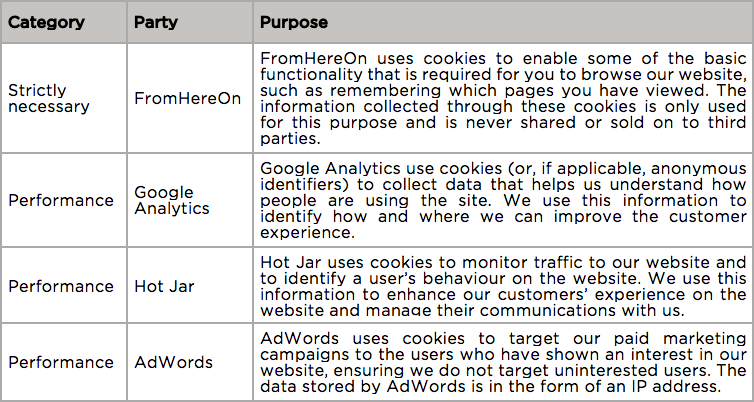 The list below details the cookies used on FromHereOn’s website. We have outlined who sets these cookies and their purpose. If the party reads something other than ‘FromHereOn’, these are our third party business partners who help us to enhance your browsing experience. Session cookies are stored in your computer's memory for the length of your browsing session. They become inaccessible after the session has been inactive for a time and are automatically deleted from your computer when the browser is closed. They allow you to move from page to page without having to log-in again. Persistent cookies are stored in your computer memory and are not deleted when the browser is closed. They are used to collect information about the numbers of visitors, the average time spent on a particular page and analyse behaviour on the website. This information is used to find out how well the website works and where it can be improved. If cookies aren't enabled on your computer, it will mean that your experience on our website will be more limited. To enable and manage cookies, you can use your browser to do this. Each browser is different, so check the 'Help' menu of your particular browser (or your mobile phone's handset manual) to learn how to change your cookie preferences.